Yo babes! How you doin'? Hehe, wanted to sound all street talk and all. Anyways, remember early this month (2 weeks ago)? I was posting so much about my first ever booth in a bazaar on Instagram and Facebook? Well, finally I got a time to write about it. Do follow my other social media sites yeah, somehow blogging always takes up 4-5 hours of my time.There were other bloggers who were part of the bazaar too. Here is just a few of us, there were more! Bet you all were thinking what did I sell right? Well mostly were half of my closet and some left over stock from my "accessory shop". It's super dead btw. Shall revive it after my finals. I'm actually more active on Carousell now, do follow me HERE <3 Anyways back to the bazaar, I sold books, accessories, clothes, shoes and even phone accessories. It was a 2 day event and you won't believe how much I got, RM 605~! Remember most of the stuff are my clothes from my closet. Was so happy when customers loved what they see. One girl even ask if I study abroad because my clothes looked foreign. I wanted to tell her, I get my clothes from all of the warehouse sales. lol. 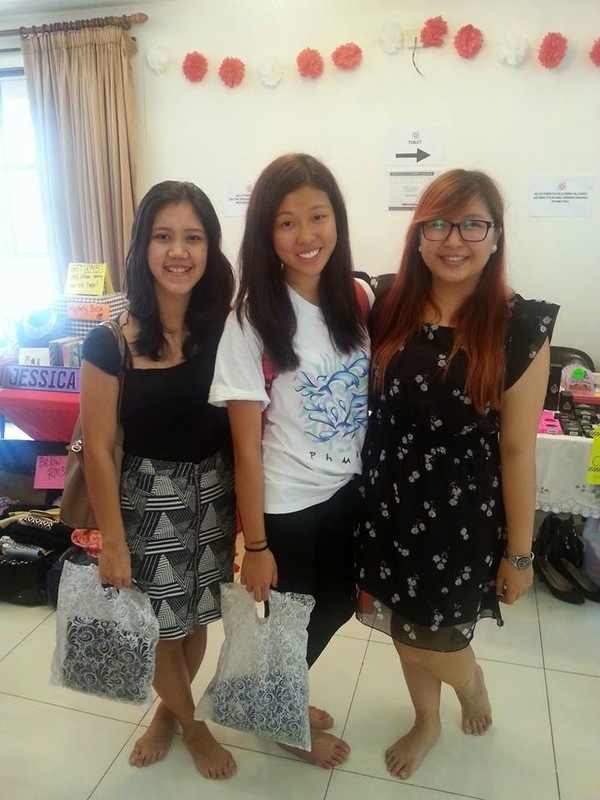 I gave away goodies to customers that spent RM 20 at my booth also! Curious to see what the other vendors sold? Shall show you my booth first. If you all like anything you see at my booth, just email me and I can sell them to you. hehe. FYI this is the first event where I did not put on any make up. So if you think I was sick or tired, it was just because I have no make up on. haha. Without kish I would have fainted. 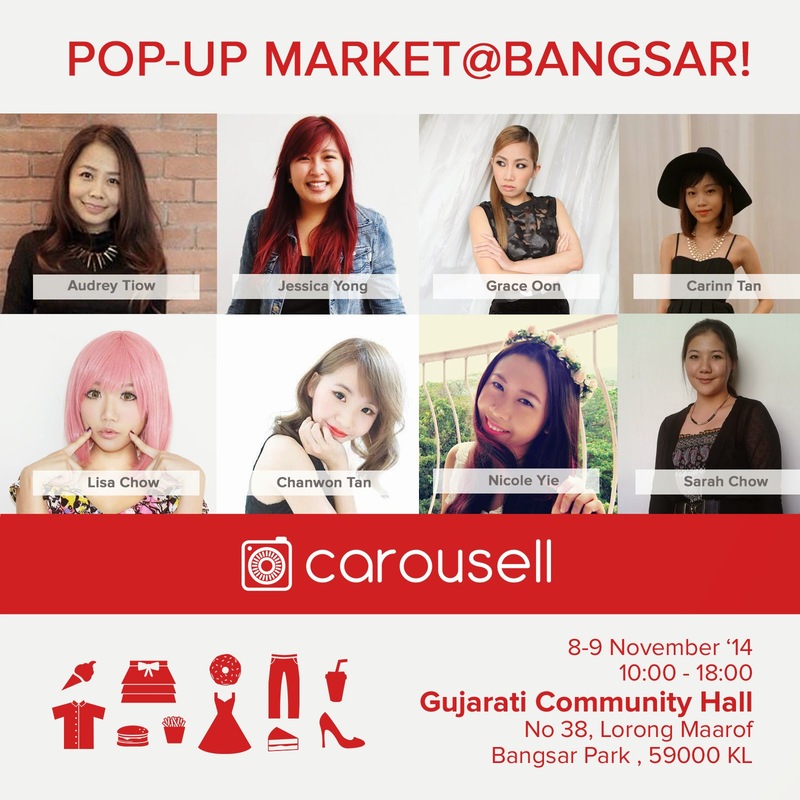 Carousell is a phone app that helps us to buy or sell stuff with a click of a button. It is also SUPER user friendly with the availability of the camera function, our own accounts, feed to show all of the stuff available on the app and a chat system to help talk to the buyers or sellers. There were a total of 54 booths placed indoor and outdoor at the event. Scroll down for the pictures! Most of the stuff that were sold downstairs are brand new and they were so cheap! Most sold their stuff for RM5- RM40. Super cheap for some lo. So of my friends that came to see me got RM 5 dresses for themselves. Too bad they didn't have my size. Oh wells, life of a plus size. haha. Didn't really take pictures as there were a lot of people and I was trying to persuade all of them to buy all of my stuff. heh. This customer got the pink boots. 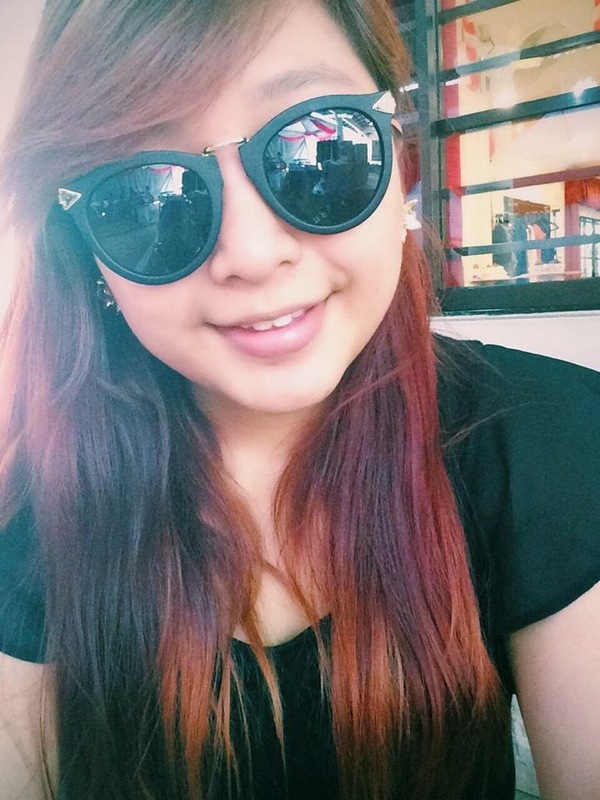 Super chio right the picture? I decided to change my entire booth. Made a lot of changes. Move some of my clothing rack here and there. At the end of this bazaar, I can say that I'm a pro at bazaar booth now. I even brought a box of food (Water and bread), just in case we needed it and sure enough we did. My booth was like the supplier for everything, from food to marker pens and paper. Can say that I bought my house with me. haha. The day went by pretty fast. FYI the JESSICA SIGN on my table was given as a gift for my 21st birthday. There were about 5 people who asked how much I was selling it for at the bazaar. Lol. Even a super cute angmor kid who wanted to buy it for his elder sister. Again I regretted not taking much photos with everyone but with only a few. Sorry yeah. Was too tired to function that day. haha. With Jane, Carinn and Ashley. Jane came to the bazaar with doughnuts! <3 It was just perfect because I was starving during the bazaar and there wasn't any food around. Super love her for it! Us at the end of the day. Completely WIPED OUT. At the end of the two days, my friend and I couldn't move. My back hurt a lot from all of the heavy lifting of my stuff. haha.